Search Results for "on the beach man relax"
Side view of happy ethnic man and woman sitting and lying while relaxing on sandy beach together. UNITED STATES: 1968: people relax on beach. Man picks up beach ball. 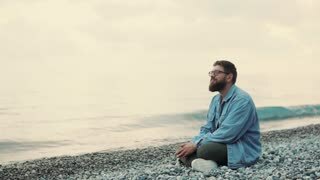 Man sits next to lady on beach. Lady listens to radio on beach. UNITED STATES: 1968: couple relax on beach Man wipes face with towel. Lady listens to radio on beach. Close up of lady's face. Romantic couple relaxing on tropical hammock. Young man and girl in blue hammock from back in beautiful beach. Young couple in love relaxing in a hammock by the beach. Summer luxury vacation. Smiling african american man on sea beach showing victory sign to fingers. Face handsome african american man relaxing on sea shore. 1970s: Hawaii. Flowers. Beach. People relax. Hotel. Golf course. Man swings club. People wait on carts. Ugly Man Binoculars Beach Sand Feet Woman. A funny ugly man looking through a pair of military binoculars, but seeing the feet of a woman relaxing on a sandy beach.